Great job on my pool, your employees are always neat, timely, informative and friendly, I am glad to recommend, Waterline Pools. 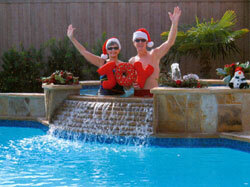 Wishing you all the best and Happy Holidays from our beautiful new pool. Thank You. Jon, FYI, your idea for the bottom pool basin was a good one! Your men did a great. They were neat, efficient, good natured and polite. Thank you. Thanks for the beautiful remodel on the pool. It far exceeded what I had envisioned. I couldn’t be happier with the work and professionalism you and your crew provided. Not to mention all the extra perks that you contributed with modifications and ideas for the design. The stone work is beautiful, and the water feature was a wonderful addition . I love looking out at my new urban oasis compliments of Waterline. What a worry free project from start to finish. 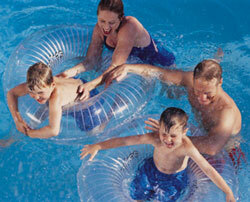 A pool built by Waterline Pools is not just beautiful to look at, it is also designed and built to be very functional. Jon uses the top of the line pool equipment that is sized and plumbed to work at it’s optimal efficiency. Jon also uses the highest quality plaster, along with a two week aftercare and monitoring program, which makes his pools stand out from the competition. President/Co-Owner Our pool turned out better than we had envisioned. Jon gave us some great ideas that we could choose from and we are completely satisfied with the quality, professionalism and timeliness in which it was finished. 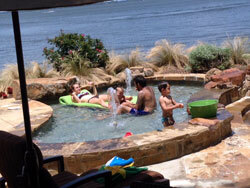 We have completely enjoyed our pool, the cabana & fireplace, the cooking island, & the new decorative spa. Waterline was easy to work with whether picking materials or making changes. We were treated like family. The most amazing and fun experience I have had in a long time. Jon Harrison and his staff went above and beyond our expectations, just like his company slogan states. 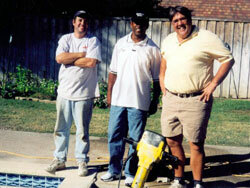 We started with a clean slate of ideas and not knowing exactly what we wanted in a pool. I had my own vision and Jon added his experience and talent to combine to build us an amazing pool. Jon was great dealing with the city and all the compliances we had to go through. Jon’s crew (Frank), are master craftsman at what they do. Hands down the best in the DFW area. His crew was always on time and pleasant to deal with and they always answered my questions. Jon really helped in selecting the right tile, stone, plaster, and style of waterfalls we wanted. He understood my vision and he executed it and delivered exactly the way I had it in my mind. Jon will walk you through every detail and keep you posted daily of what the next step is. He makes it so easy. If you are searching for your dream backyard and your dream pool, Jon Harrison will make this happen. Thank you Jon for all your hard work and creating a beautiful pool for us.